For Christmas last year, I was lucky to receive lots of great gifts, including the fab cookbooks: Jamie's Great Britain and Heston Blumenthal at Home. 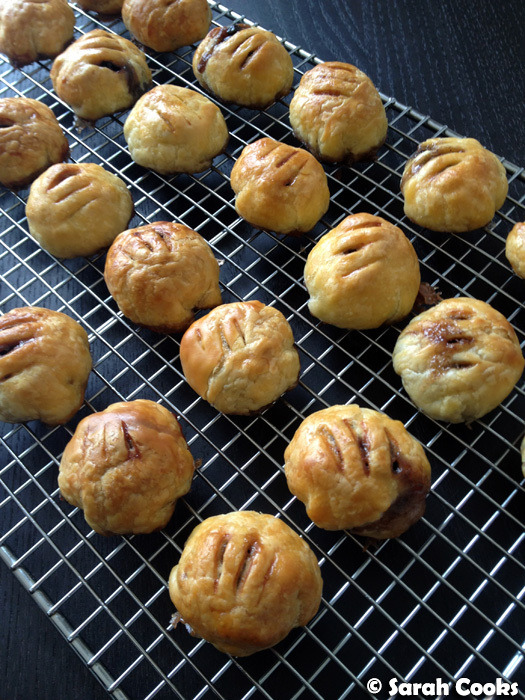 One of the first recipes that caught my eye was Eccles cake - a traditional British pastry consisting of puff pastry and a filling of currants - which appears in both books. Anyhoo, It was seeing (and eating!) a lovely little Eccles cake at MoVida Bakery the other week that reminded me of my desire to bake these, and my friends hosting a Christmas-in-June party that provided the perfect opportunity. I ended up using the Heston Blumenthal recipe for Eccles cake because the photo looked prettier, the recipe and ingredients list were much simpler than Jamie's (yes, really!) and, significantly, Heston serves his Eccles cake with potted Stilton, which sounded like absolute heaven to me! I won't type out the recipe here because even though I made some small changes and was pleased with the final product, I still have to experiment with the recipe until I've got it just the way I like it and I'm confident that I could repeat the results consistently. But as I said above, the original recipe comes from Heston Blumenthal at Home, and was also published online at The Mirror last year, as part of a "perfect Christmas lunch" feature. I know Heston has a reputation for crazy complicated recipes requiring dry ice and a million pieces of exotic kitchen equipment, but the Eccles cake recipe is very simple, with clearly written, precise instructions. It's well worth having a crack at it! 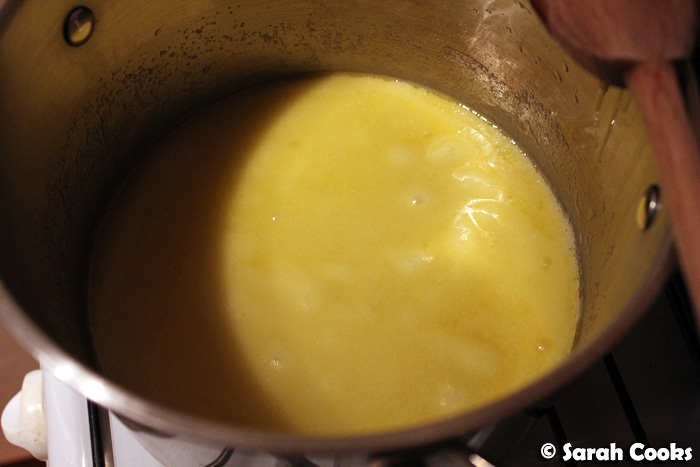 ... to which you add a mixture of melted butter and caster sugar. 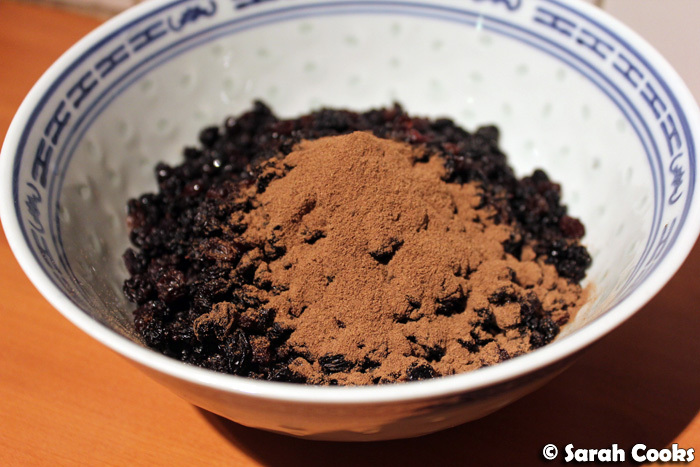 The mixture looks a bit like pulut hitam, don't you think? 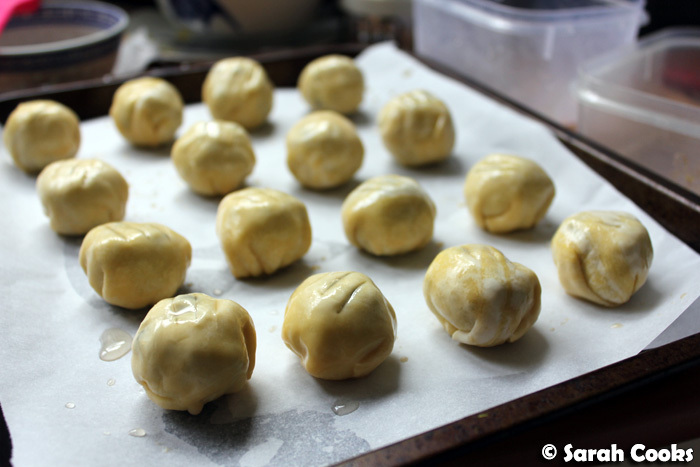 He then instructs you to let the mixture cool completely, roll it into little 25g balls, and stash them in the freezer to solidify. Some people might find this level of precision annoying, but I think it's fantastic! How much easier is it to achieve consistent results with instructions like that, rather than the usual "roll them into walnut-sized balls" or "roll tablespoonfuls of the mixture into balls"? Besides, I have a very precise set of digital scales (very cheap and effective) that I love to distraction. I actually can't stand working in cups and volumes - American versions of cookbooks drive me nuts! - and I find weighing ingredients to be so much easier. I've noticed that almost all the ingredients in Heston Blumenthal at Home are specified in terms of grams, even things like water, vinegar, olive oil , so precision is obviously very important to him. 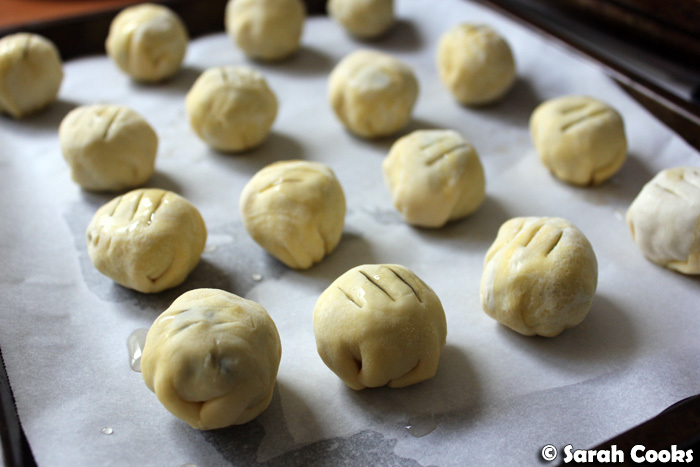 Once the filling is frozen, the next stage is to wrap them up in puff pastry. I instinctively wanted to buy super-yummy buttery Carême pastry, but it rises like crazy, and I had visions of big, puffy, Eccles cakes that were more air than pastry. (Remember when I tried to make mille feuille out of Carême? Eek!) Sometimes I think Carême's crazy layers are more about showing off than practicality! So I actually bought a standard supermarket ready-rolled all butter puff pastry, which worked very well. You know, for all my talk about precision and weights and measurements, I wasn't very precise with cutting out the pastry circles. 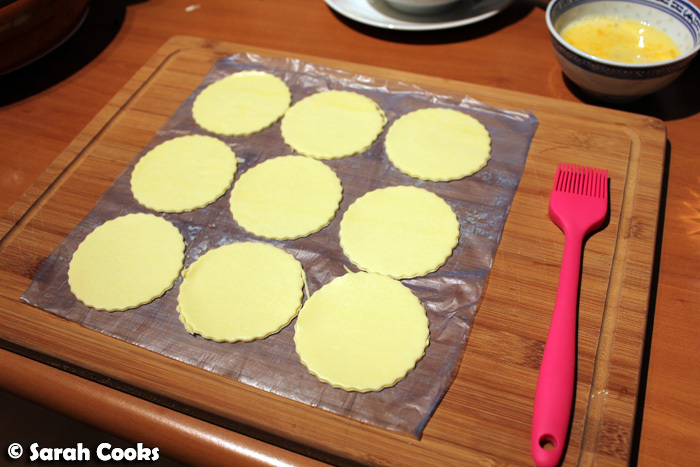 The recipe specifies to cut out the pastry into 9cm circles, but I don't own a ruler and just used the largest round cutter I have. 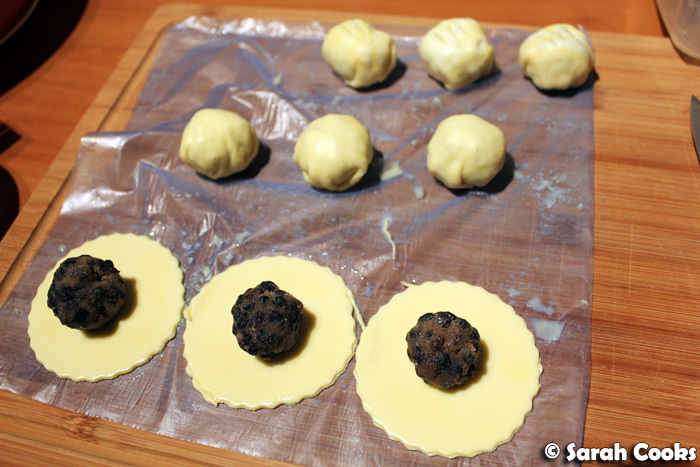 It turned out that the pastry circles were too small to enclose my frozen 25g balls (heh), so I had to resize my filling balls before I could continue. Whoops! I ended up with twenty-seven cakes, as opposed to the sixteen specified in the recipe, so mine must have been quite a bit smaller than Heston's. Whilst they were baking, I made the potted Stilton, which just involves whizzing together butter, Stilton and mascarpone, before drizzling in some water, Pedro Ximinez sherry and a dash of vinegar and mixing until smooth. I found that the solids didn't cohere too well with the liquids, no matter how much I whizzed the mixture, resulting in a rather unattractive mixture of white solids floating in a grey liquid. 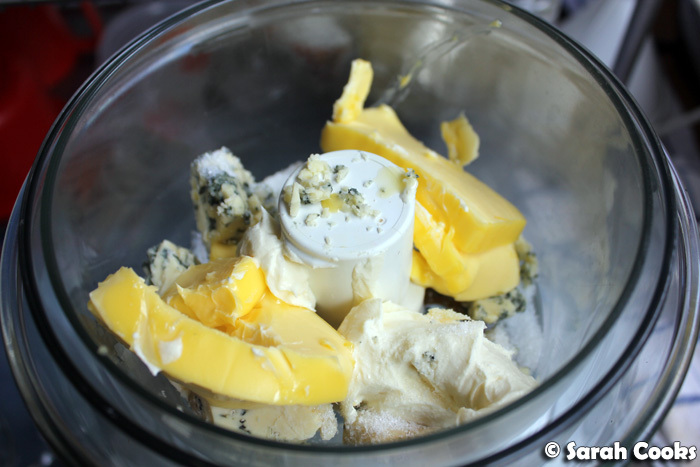 I think this is because I didn't soften the butter and Stilton sufficiently before whizzing them up - next time I would make sure both are super, super soft before mixing! If I'd had more time (and my kitchen wasn't already in a huge mess), I would have transferred the mixture into my Kitchen Aid and beaten it on a high speed until smoothly combined. However, the taste wasn't affected, and it looked fine once decanted into little ramekins and refrigerated. Phew! Here are the little cakes, all baked! With all the baking, I totally forgot to bring a proper plate for the Eccles cakes, so just arranged them on the lid of my container... until James saw it and was like: "Er, if you've gone to the trouble of baking those, perhaps you'd like a proper plate! ", and whipped out that pretty silver plate you see at the top of this post. Fab! But how did they taste? The cakes themselves were extremely sweet, rich and intense - too intense to eat by themselves, actually. 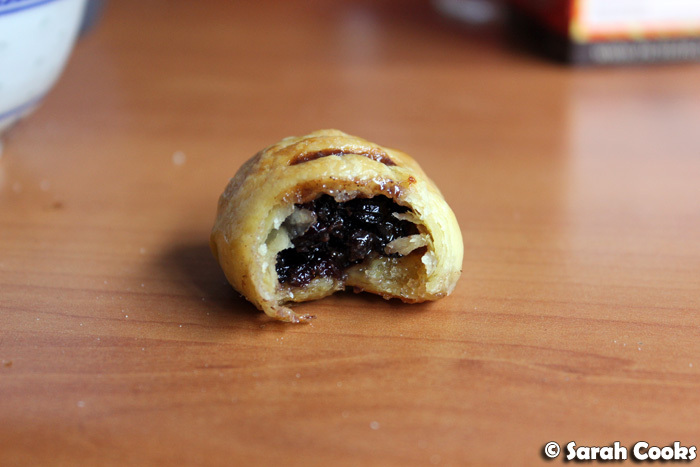 Eccles Cake - Looks like a Hneoh Pneah, right? But once you add the potted Stilton, it just became magic. 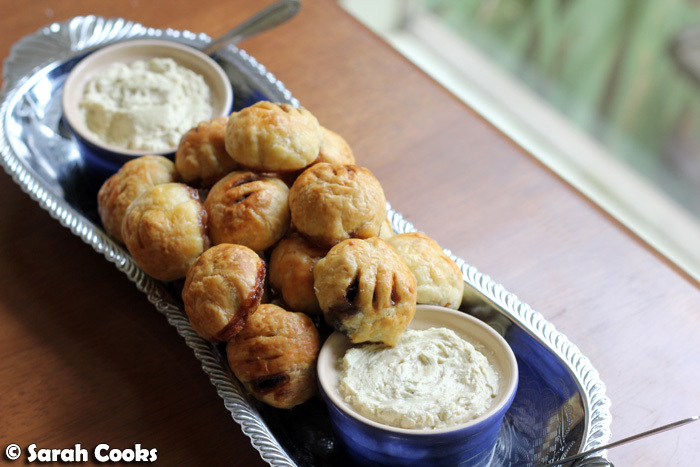 The buttery pastry, the intensely sweet and spicy filling, and the sharp blue cheese combined perfectly, and I absolutely loved it. (It might seem unusual, but the combo of flavours was similar to, say, having quince paste or muscatels on a cheese board). I found that the best way to eat these was to take a little bite, spoon on some potted Stilton and then inhale. Heston's Eccles cakes were quite different from the MoVida ones, which weren't nearly as sweet or intense, and perfectly nice to eat by themselves as an afternoon tea treat. Heston's ones, however, were a different breed altogether, super spicy and rich, coming alive with the sharp taste of the Stilton. This reminds me, I love the combo of spicy sweet cake and sharp cheese. Apart from Eccles cake and Stilton (or the trad accompaniment, Lancashire cheese), can anyone recommend or suggest some great combinations? I love loaf gingerbread with a sharp cheddar or gorgonzola, and I've heard that apple pie can be good with a cheddar cheese crust. I don't think of Heston's Eccles cake as an easy crowd pleaser, but rather one to make when you want to indulge in some very grown-up tastes. (Although I must say, everyone who I saw eat one at the party said they were nice, but perhaps they were just being gracious in my presence, hehe). Can you imagine sitting around on a cold European Christmas in front of the fire with a plate of these, a bowl of potted Stilton and a nice glass of port or sherry? Perfection. Absolutely to the weighing! I don't tend to write this in my own recipes, but I totally OCD-weigh out my raw/no-bake nut balls (HEH) to make sure they're all the same size. 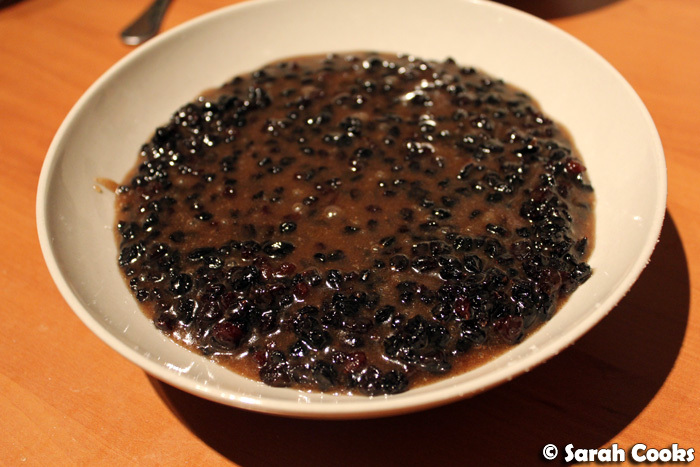 Sadly, I abhor both fruitmince and currants so must say all of these British treats make my stomach go "meep", but heck I'd love some potted stilton! How Christmassy :) they look great! These look brilliant! I might wait until Christmas to make these, even though the weather is perfect now (Southern Hemisphere problems). 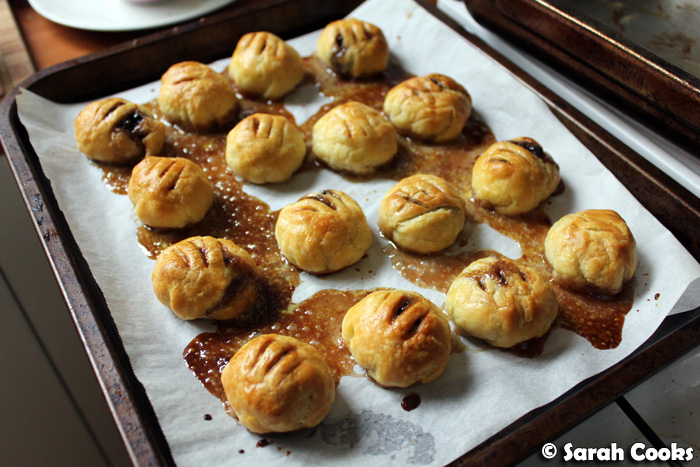 Mmm, I adore Eccles Cakes but have never tried making them. I'd never thought of eating them with cheese either, but it sounds an excellent combination. On the sweet/savoury theme, a slice of Christmas Cake (or any fruit cake) is great with a slice of crumbly white cheese like Wensleydale or Lancashire. I also love the creamy garlicky 'Le Roule' soft cheese on a sweet digestive biscuit. Lorraine - Definitely try one if you come across them in your travels - they're delicious! Hannah - How much better is baking when you weight things!! I reckon the potted Stilton would be nice spread on bread or on a cracker if you're not into currants! Michelle - Interesting! I hadn't thought of that connection. Sophie - They're SO nice on a cold day with a glass of sherry! Norm - Thank-you for your suggestions! The Christmas Cake idea sounds right up my alley. I must try that at Christmas this year! What an absolutely brilliant post! Love the attention to detail and advice from your experience with this recipe. Beautiful photography too! Hope to reference this when we try to recreate Heston's Mince Pie recipe. I had these at a friend's last year and could not believe how divine they are! 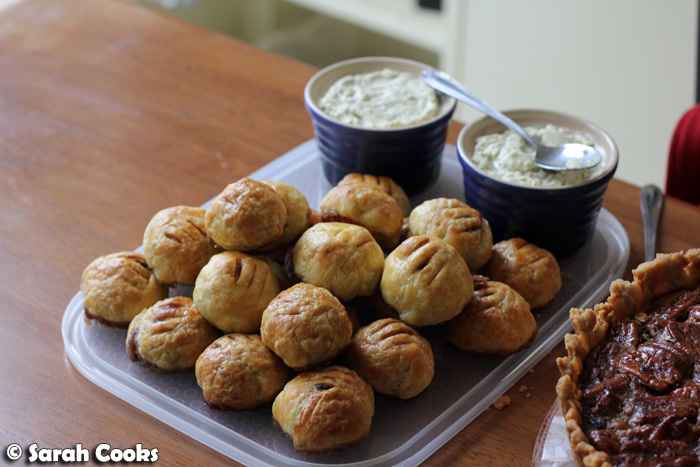 I am making them for my Christmas this year, to wow my very English-into-trad-Brit-food mother-in-law. 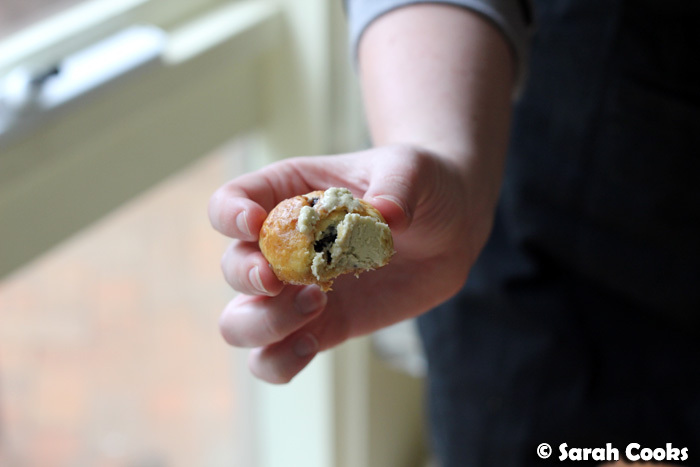 Let us know how you think our Heston Mince Pie / Eccles cake fusion turned out! Naturally we gave you full credit for the inspiration and reference. I had no idea Heston was so huge in Australia, half the blog posts I read about his stuff are from you guys! Would love to know what you Heston Waitrose stuff you've tried, drop us a line & let us know! Phil/In Search of Heston - Wow, your eccles pies looked fantastic! Thank you so much for letting me know about them!